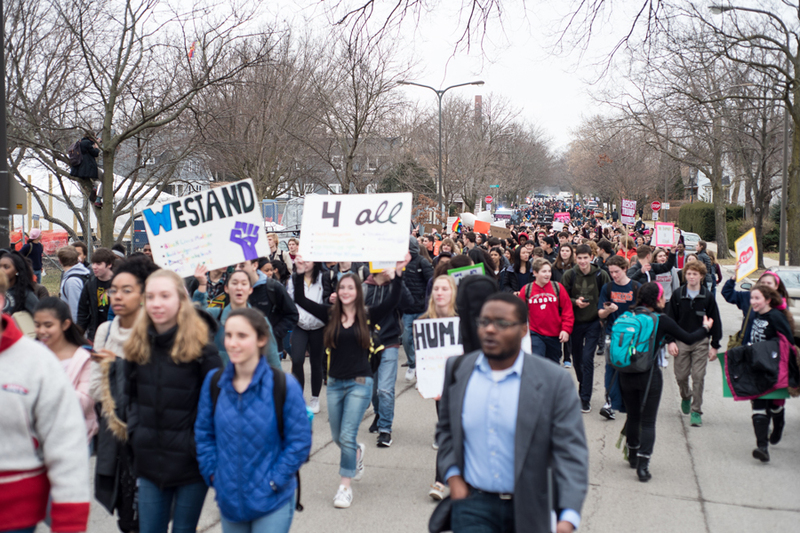 Students at Evanston Township High School protest President Donald Trump's inauguration last winter. ETHS students are planning a walkout in support of gun control on March 14. In response to the shooting, ETHS students will participate in a nationwide student walkout on March 14 to advocate for stricter gun control legislation. ETHS Student Senate has taken charge of organizing the walkout. Student Senate president Emma Stein said the idea for the demonstration originated from a social media post by the organizers of the national Women’s March calling for a March 14 walkout. Stein said she wanted the Senate to respond to that call. ETHS junior Trinity Collins, who plans to participate in the walkout, said she has drawn inspiration from watching other teenage gun control advocates across the nation. Collins said that by participating in the walkout with other ETHS students, she hopes to demonstrate the student body’s unity on the issue. The Student Senate is currently discussing programming and logistics for the walkout with other student groups, the student body and the administration, Stein said. Students are planning to hold the demonstration at Lazier Field, Witherspoon said. Witherspoon said the school is planning to coordinate with Evanston Police Department to direct traffic during the walkout. He added that students may receive unexcused absences, as per school policy, but the administration will not penalize students for participating in the demonstration. As student activists continue to exercise that free expression, Stein said she hopes to memorialize the lives of gun violence victims through the walkout. Additionally, she said she hopes to influence policymakers as they draft gun control legislation.